Capacity Study for the Central Arizona Project Canal - Hayden Rhodes (AZ) | WEST Consultants, Inc.
WEST assisted the Central Arizona Water Conservation District (CAWCD) in examining the capacity of a portion of the Central Arizona Project (CAP) to confirm existing capacity and evaluate the feasibility of possible increased flows. 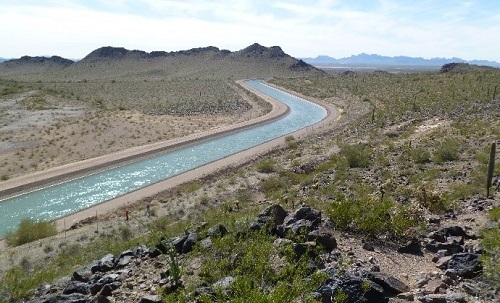 The Hayden-Rhodes Aqueduct is a section of the Central Arizona Project (CAP) Canal that spans from the Colorado River to the Salt Gila Pumping Plant, a distance of 190 miles. The Hayden-Rhodes Aqueduct includes several pieces of infrastructure including trapezoidal canals, inverted siphons, tunnels, and pumping plants. The maximum design flow of the Hayden-Rhodes Aqueduct is 3,000 cubic feet per second (cfs). CAWCD prepared a draft technical feasibility report, where they examined the feasibility and cost of increasing the capacity from 3,000 cfs to 3,600 cfs while maintaining the same safety and reliability standards of the existing infrastructure. CAWCD staff determined that this increase in capacity was feasible, but at an estimated cost of $240 million. WEST used HEC-RAS to determine the existing capacity of the Hayden-Rhodes Aqueduct. Steady -flow models were developed and calibrated at the design discharge to determine model roughness and gate openings, confirming the Hayden-Rhodes Aqueduct has a capacity of 3,000 cfs. WEST then developed unsteady flow models to model emergency shut down scenarios, simulating loss of power at the pumping plants. Gates were closed and the inflow and outflow were stopped over a 10-minute period. The closing of the gates caused a surge in the water levels in the canal and reflection waves traveled upstream. Model results demonstrated the canal indeed had the capacity to handle an emergency shut down scenario for the design discharge of 3,000 cfs. During higher than design discharges, however, overtopping of road embankments adjacent to the canal occurred in some areas.